Tues. March 5th: I ate a potato. Monday June 4th: I thought about eating a potato, but thought it best not to because I had already had plenty of starch that day. Saturday July 8th: While cleaning out my gutters, I noticed that a sweet potato weevil had been watching my every move. Monday October 20th: I walked an unbeaten path and found myself in the midst of a family of wild turkeys. Wednesday June 26th: While walking a desolate beach, I came across a dead pig, half sunk in the sand with it's snout stuck in contaminated water. Thursday June 27th: I camped in the woods near the dead pig. The night was filled with ungodly screaming and sqealing sounds. Friday June 28th: The dead pig was gone. Tuesday July 29th: A small frog hangs out at my pond these days. 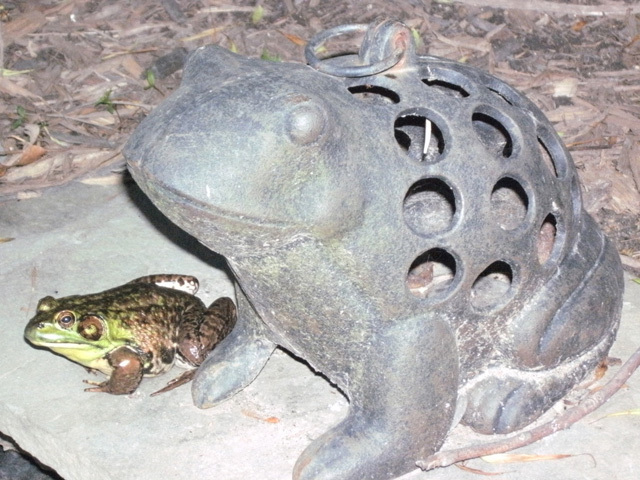 Tuesday August 12th: There are now two frogs. Friday August 28th: I feed the frogs worms. They're female Green frogs. Wednesday September 22th: Some spooked grave yard idiot ran through my yard last night, breaking the grape vines by the pond. The frogs were ok.
Monday November 21th: I thought about buying pants today. November 29th: I grew old today and forgot about the pants. Monday January 5th: A Calico/Tabby cat lives with me now. Sunday April 25th: A red fox came into my back yard and ate out of my compost. Wednesday May 2: I got poison oak all over me. I look a sight and I've been hiding in the shadows, living like a leper. Thursday October 19th: I bought the pants.